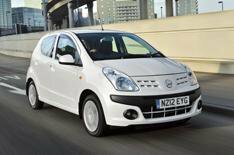 2012 Nissan Pixo now on sale | What Car? The 2012 Nissan Pixo has received a number of upgrades, including CO2-cutting tweaks and a range of new colours. The changes mirror those made to the closely related 2012 Suzuki Alto. Updates to the Pixo's 1.0-litre petrol engine and aerodynamic improvements have reduced CO2 emissions by 4 g/km to 99g/km, so owners will pay no road tax and be exempt from the London Congestion Charge. Average fuel economy rises from 64.2mpg to 65.7mpg. Two new metallic paint colours are available: Glistening Grey and Midnight Purple. Inside, there's new black trim around the glovebox and centre console and every model now comes with an auto-dimming rearview mirror. Prices are unchanged and range from 7250 for the 1.0 Visia to 9150 for the 1.0 N-tec auto. The updated Pixo, which is on sale now, arrives at a busy time in the city-car market, following the 2012 launches of the Seat Mii, Skoda Citigo and VW Up, along with updated versions of the Citroen C1, Peugeot 107 and Toyota Aygo.